The new version of EMCO MSI Package Builder allows successful repackaging of 99.6% of currently available Windows installations into silent MSI packages that can be deployed automatically on remote PCs. EMCO MSI Package Builder uses the advanced monitoring technology to repackage non-silent installations into silent MSI packages. 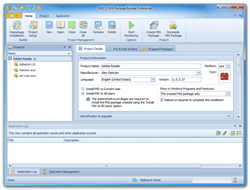 EMCO Software, a leading provider of application packaging/repackaging software for Windows has announced availability of a new version of its EMCO MSI Package Builder software. The new version includes a number of significant improvements that allow repackaging of 99.6% of all available non-silent Windows installations into silent MSI packages to enable their automatic remote deployment. As a result, network administrators can deploy almost any application to thousands of computers in a local network in a few clicks. EMCO MSI Package Builder is a Windows application designed to create MSI packages and to convert installations of other types into MSI packages. It is used by IT professionals who need to create installations quickly and easily. MSI packages can be created in line with the needs of an IT department. In most cases, the application is used by network administrators who need to deploy existing software across a network. Usually, original installations provided by software vendors are not ready for unattended deployment required for remote software distribution since most software installations should be deployed in an interactive mode. EMCO MSI Package Builder allows an automatic converting of such installations into silent MSI packages ready for remote deployment. EMCO MSI Package Builder uses the advanced monitoring technology to repackage non-silent installations into silent MSI packages. The application tracks all file system and registry changes performed by the repackaged installation started manually. The collected changes are used to automatically generate an MSI package equivalent to the original installation. The MSI package includes all the settings configured during the repackaging process, so it can be deployed silently without interacting with a user. "The latest version of EMCO MSI Package Builder includes the advanced changes capturing technology capable of tracking file and registry changes, Windows services deployment, Windows permissions and environmental variable changes and even deployment of simple Windows drivers to reconstruct an installation from the captured results. This enables repackaging of over 99% of all installations available today to allow network administrators to deploy them automatically over a local network," Thorarinn Oskarsson, CEO at EMCO Software, says. For detailed information on the application features, refer to the EMCO website at http://emcosoftware.com/msi-package-builder/convert-exe-to-msi. Information about the MSI creation options is available at http://emcosoftware.com/msi-package-builder/create-msi-package. EMCO MSI Package Builder is available in two editions: Professional and Enterprise. Both editions include changes monitoring features that can be used to convert non-silent installations into silent MSI packages. The Enterprise edition features the advanced monitoring technology, which allows repackaging installations that deploy Windows services. Any edition of the application may be evaluated for free during 30 days. The prices start at $599 per license for the Professional edition of the application. More detailed information is available at http://emcosoftware.com/msi-package-builder. EMCO Software is a provider of integrated software solutions that help organizations to reinvent approaches to their computer networks management. EMCO Software award-winning products enable organizations to manage their IT environments remotely and automate their network administration procedures, including network inventory, software deployment, power management, and network & security control. Founded in 2001, EMCO Software is headquartered in Reykjavik, Iceland, with operations around the globe. Today, more than 20,000 organizations in 85 countries, including Fortune 100 and Fortune 500 companies, trust EMCO Software products.